Action: Raise your threat by 2 to claim this objective when it is free of encounters. When claimed, attach Gandalf's Map to a hero you control. (Counts as an attachment. If detached, return Gandalf's Map to the staging area.) Attached hero cannot attack or defend. Action: Raise your threat by 2 to claim this objective when it is free of encounters. When claimed, attach Dungeon Torch to a hero you control. (Counts as an attachment. If detached, return Dungeon Torch to the staging area. )Forced: At the end of each round, raise attached hero's controller's threat by 2. Action: Raise your threat by 2 to claim this objective when it is free of encounters. When claimed, attach Shadow Key to a hero you control. (Counts as an attachment. If detached, return Shadow Key to the staging area. )Forced: At the end of each round, attached hero suffers 1 damage. Action: Exhaust a hero to claim this objective if it has no encounters attached. Then, attach Athelas to that hero. When Revealed: Deal 4 damage to a hero controlled by the player guarding Gollum. That player must choose a new player to guard Gollum, if able. Shadow: Deal 2 damage to a hero controlled by the player guarding Gollum. When Revealed: The last player deals damage equal to The Nameless Fear's attack to a hero he controls. This effect cannot be canceled. Shadow: Deal damage equal to The Nameless Fear's Attack to the defending character. When Revealed: The first player must discard 3 resources from each hero he controls. Shadow: Defending player must discard 2 resources from each hero he controls. Action: Exhaust a hero to claim this objective. Then, attach Book of Mazarbul to that hero. (If detached, return Book of Mazarbul to the staging area. )Attached hero cannot attack and does not exhaust to commit to a quest. Attach to a hero. 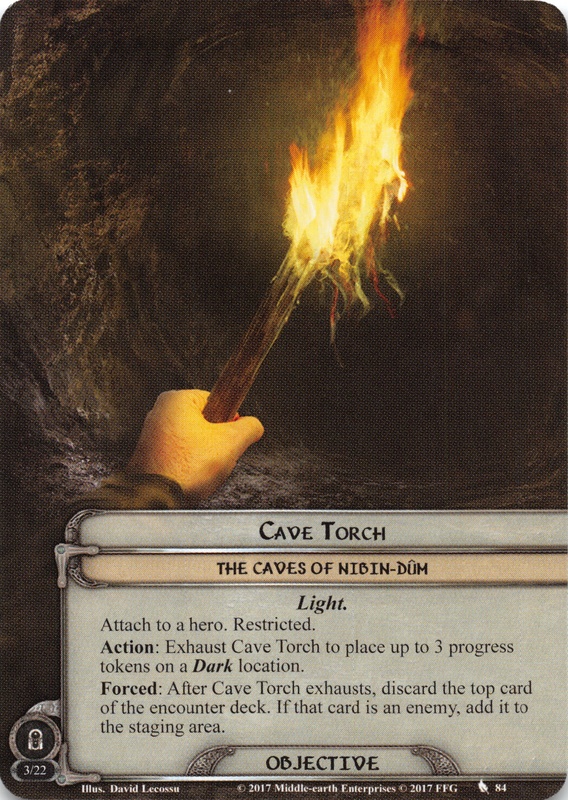 Action: Exhaust Cave Torch to place up to 3 progress tokens on a Dark location.Forced: After Cave Torch exhausts, discard the top card of the encounter deck. If that card is an enemy, add it to the staging area. Response: After you travel to Ruined Road, the first player places 2 progress tokens on it or readies 1 hero he controls. When Revealed: The first player attaches Durin's Greaves to a hero of his choice as an attachment. Attached hero gets +1 Defense. Attached hero gets +1 Defense. If attached hero is a Dwarf, it gets +2 hit points. Action: Exhaust a hero to claim this objective. Then, attach Durin's Helm to that hero as an attachment. When Revealed: Each player chooses and shuffles a hero he controls into his deck. When he draws that hero, he puts it into play. Shadow: If attacking enemy is Nameless, the defending player must discard his hand. If unattached, return Alcaron's Scroll to the staging area and it gains: 'Action: Exhaust a hero to attach Alcaron's Scroll to that hero. 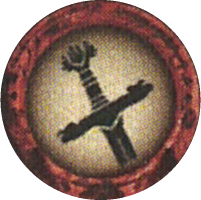 'Forced: When the hero with Alcaron's Scroll attached is damaged by an enemy attack, attach Alcaron's Scroll to that enemy. Action: Exhaust a hero to claim this objective, add it to the victory display, and place 1 resource token on the current quest. Action: Exhaust a hero to claim this objective and attach it to that hero.Action: If attached to a hero, add Secret Map to the victory display to place 3 progress tokens on the active location. Action: Exhaust a hero to claim this objective, add it to the victory display, and place 2 resource tokens on the current quest. Reveal 1 additional card from the encounter deck and add it to the staging area during the staging step each round.If a hero is destroyed by an enemy attack, the players have lost the game. When Revealed: Each hero must pay 1 resource or take 1 damage. If no hero takes damage from this effect, Men in the Dark gains surge. Shadow: Attacking enemy gets +1 Attack for each hero the defending player controls with no resources. While a player controls a hero with Mugash attached, Mugash's Guard engages that player. Forced: After Mugash's Guard destroys a character, if Mugash is attached to a hero, return Mugash to the staging area. Action: Exhaust a hero to claim this objective when it is free of encounters. Attach Mugash to that hero. Forced: After attached hero takes damage, return Mugash to the top of the encounter deck. 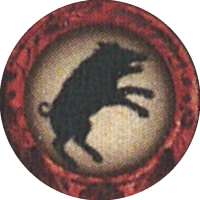 If unattached, the first player must claim Key of the Boar and attach it to a hero he controls. If Key of the Boar is discarded, add it to the staging area. 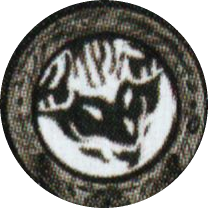 Shadow: Shuffle Key of the Boar back into the encounter deck. If unattached, the first player must claim Key of the Wolf and attach it to a hero he controls. If Key of the Wolf is discarded, add it to the staging area. Shadow: Shuffle Key of the Wolf back into the encounter deck. 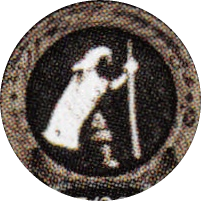 If unattached, the first player must claim Key of the Raven and attach it to a hero he controls. If Key of the Raven is discarded, add it to the staging area. Shadow: Shuffle Key of the Raven back into the encounter deck. If Celebrimbor's Mould is free of encounters, the first player claims it and attaches it to a hero he controls. If the attached hero leaves play, the players lose the game. Forced: After the last time counter is removed from this quest cards, each player deals 4 damage to a hero he controls. Then, place 4 time counters on this quest card. Characters cannot be healed. Response: After Make Camp is defeated, each player heals up to 3 damage from a hero he controls. If unattached, return Gate Key to the staging area and it gains: "Action: Exhaust a hero to claim Gate Key and attach it to that hero." Action: Exhaust Gate Key and attached hero and spend 3 resources from attached hero's resource pool to look at the facedown side of a Temple of the Deceived. When Revealed: Each Uncharted location in the staging area gets +1 Threat until the end of the phase. 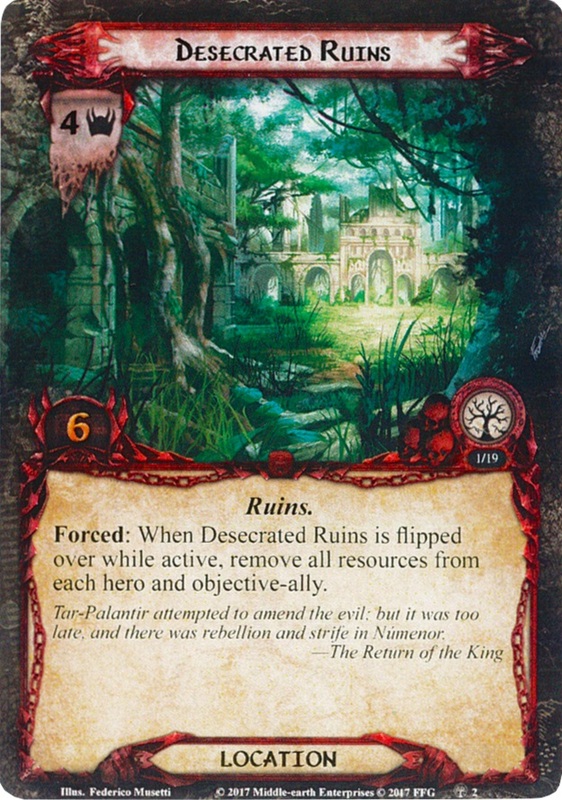 If the active location has the Ruins trait, discard 1 resource from each hero and objective-ally in play. While Sunken Temple is the active location, treat each attachment as if its printed text box is blank (except for Traits). Forced: If Sunken Temple is the active location at the end of the quest phase, discard 1 resource from each objective-ally an each hero's resource pool. Then, you may flip Sunken Temple to its Grotto side. Characters cannot be readied by player card effects. Response: When this stage is defeated, each player readies 1 hero he controls. While Durin's Key is free of encounters, the first player attached it to a hero he controls. Action: Exhaust Durin's Key to give each location -1 Threat until the end of the phase. Forced: At the beginning of the quest phase, the player who controls Durin's Key looks at the top 3 cards of the encounter deck, chooses 1 to reveal, and discards the rest. Characters do not count their Defense when defending against Dagnir. 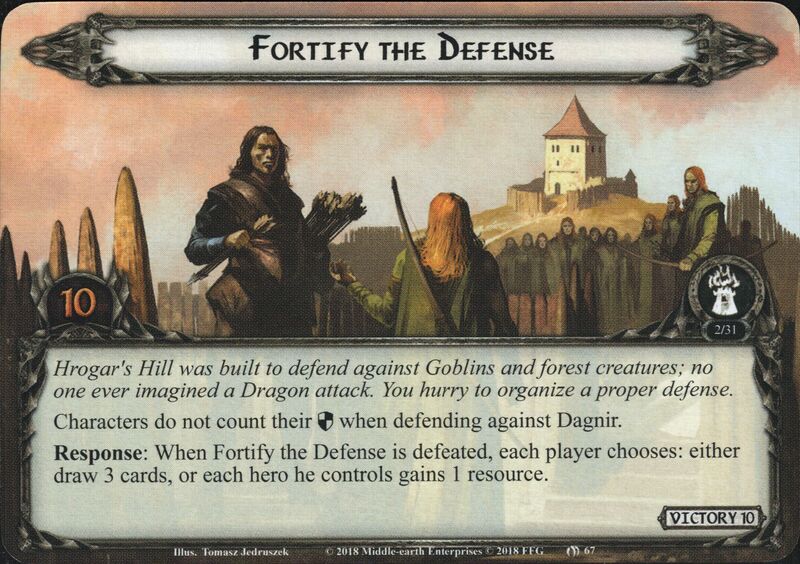 Response: When Fortify the Defense is defeated, each player chooses: either draw 3 cards, or each hero he controls gains 1 resource. 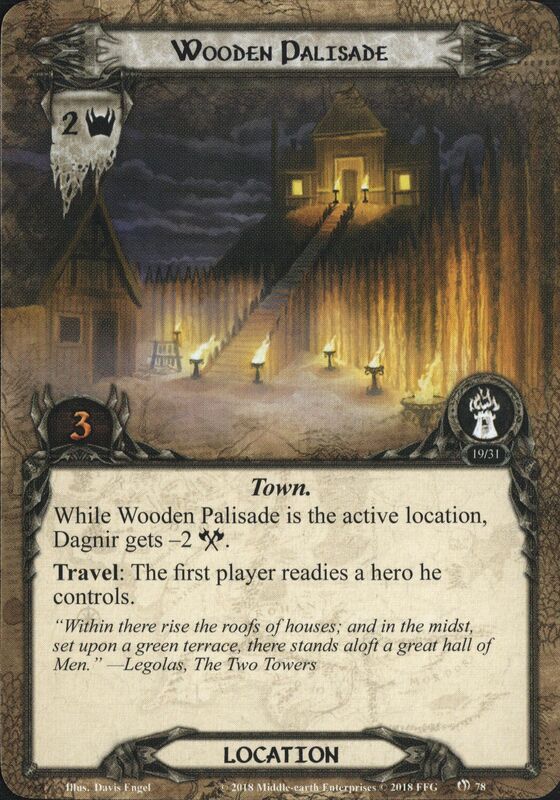 While Wooden Palisade is the active location, Dagnir gets -2 Attack. Travel: The first player readies a hero he controls. If unattached, the first player claims Crypt Key and attaches it to a hero he controls. Response: When the players travel to a Discover location, exhaust Crypt Key to either increase or decrease its Discover value by 1 before resolving it. 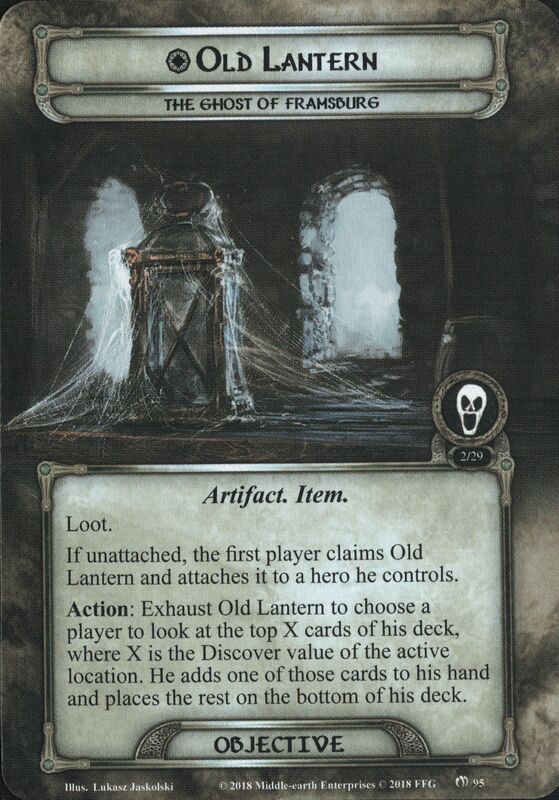 If unattached, the first player claims Old Lantern and attaches it to a hero he controls. Action: Exhaust Old Lantern to choose a player to look at the top X cards of his deck, where X is the Discover value of the active location. He adds one of those cards to his hand and places the rest on the bottom of his deck. If unattached, the first player claims Scatha's Teeth and attached it to a hero he controls. Action: Exhaust Scatha's Teeth and attached hero to choose a player. That player reduces his threat by 2. When Revealed: Either exhaust a hero you control, or engaged Crebain from Dunland. 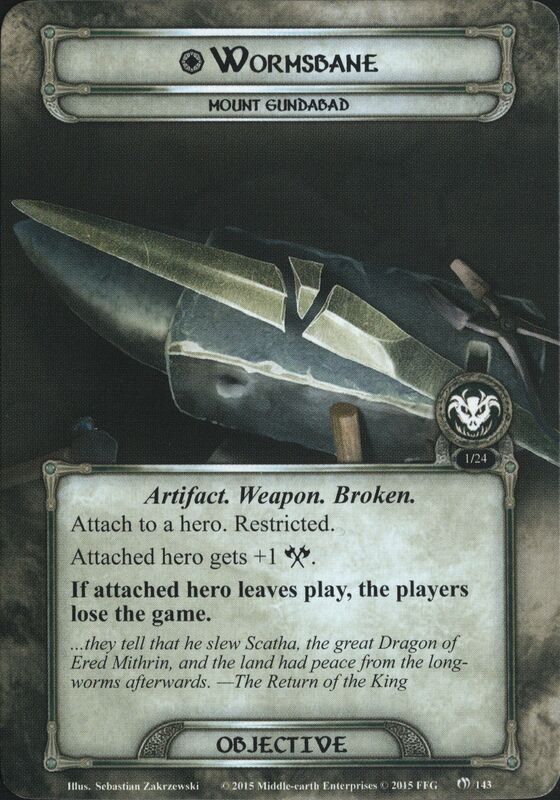 Forced: After Crebain from Dunland engages a player, reveal the top card of the encounter deck. Immune to player card effects. Response: When The Great Bridge is explored, discard a hero from play to deal X damage to The Balrog. X is that hero's threat cost. 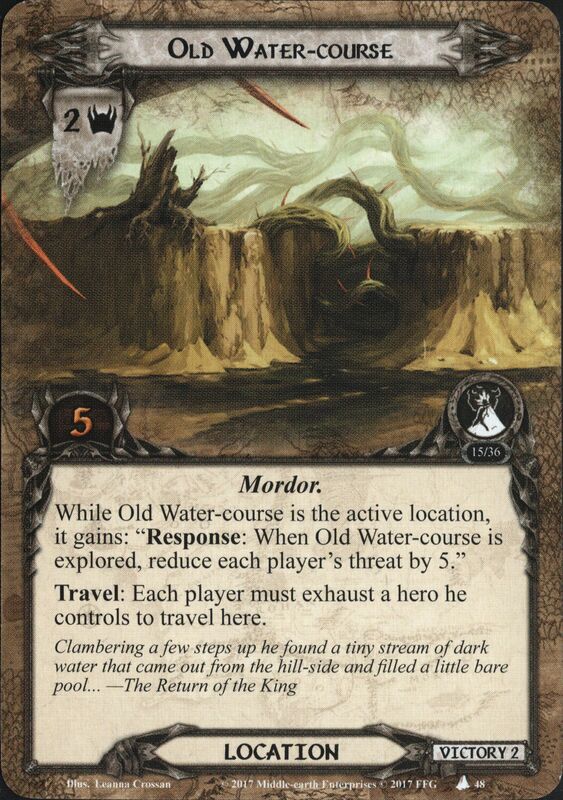 Then, The Balrog loses all keywords for the remainder of the game. Any player may trigger this response. While Eastemnet is the active location, it gains: "Response: After Eastemnet is explored, add 1 resource to each hero's resource pool." Travel: Increase the pursuit value by 1. While Deeping Wall is the active location, each hero gets +1 Defense. Forced: When Deeping Wall is explored, raise each player's threat by 4. While Postern Door is the active location, each hero gets +1 Attack. Forced: When Postern Door is explored, until the end of the round, players cannot declare attacks. 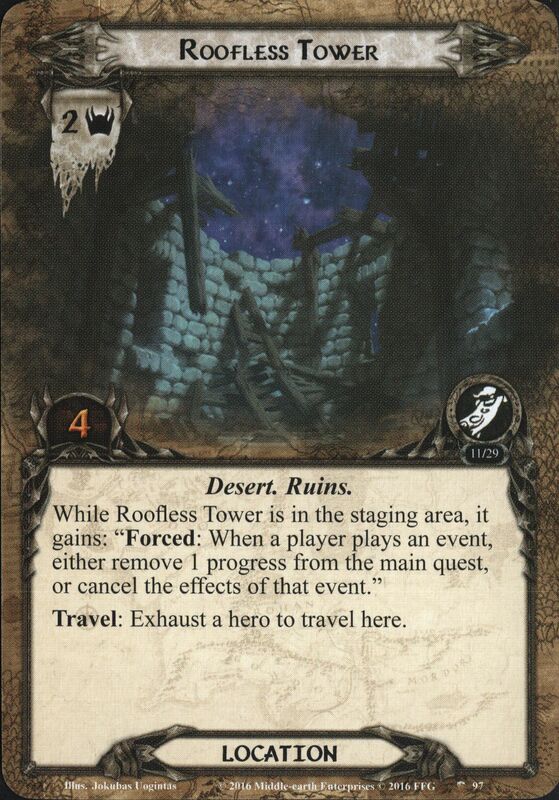 When Revealed: Either deal 2 damage to a hero you control, or deal 2 damage to Minas Tirith. 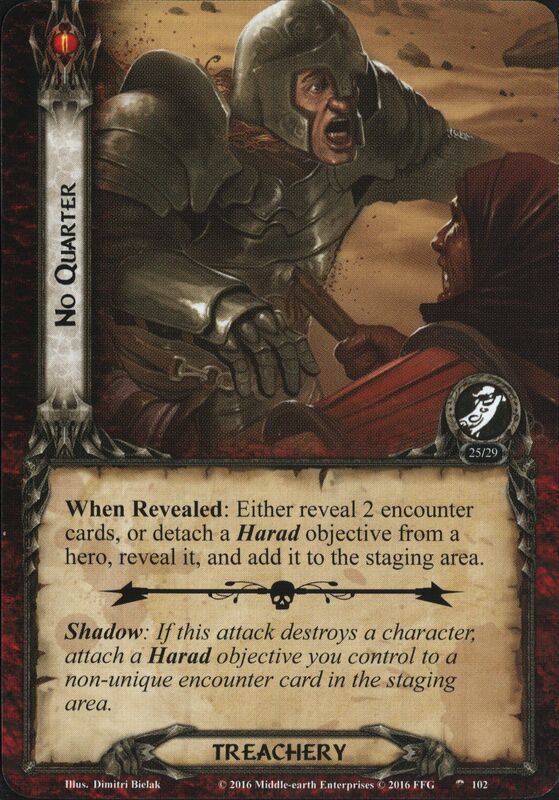 Shadow: Attacking enemy gets +1 Attack (+2 Attack instead if it has the Mordor trait). Shadow: If this attack damages a hero, attach Black Dart to that hero. When Revealed: Each player deals 1 damage to a hero he controls. Until the end of the round, treat the printed text box of each damaged character as if it were blank, except for Traits. While Old Water-course is the active location, it gains: "Response: When Old Water-course is explored, reduce each player's threat by 5." Travel: Each player must exhaust a hero he controls to travel here. Attach to a hero. Action: Exhause Cave Torch to place up to 3 progress tokens on a Dark location. 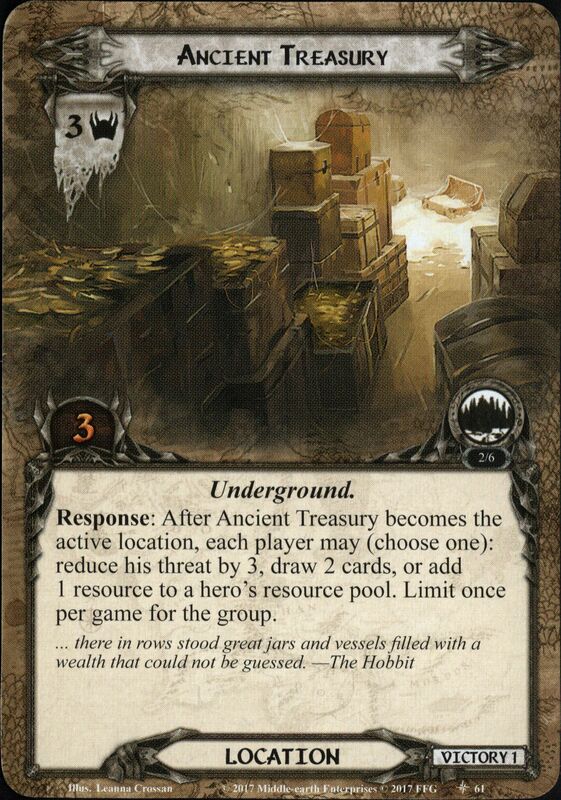 Forced: After Cave Torch exhausts, discard the top card of the encounter deck. If that card is an enemy, add it to the staging area. When Revealed: The first player attached Driven by Fear to a hero he controls. Counts as a Condition attachment with the text: "Attached character's Willpower is reduced to 0. Treat attacked character's text box as if it was blank (except for Traits.)" While this location is in the staging area, all ready heroes lose all Lore, Leadership, Spirit and Tactics icons. Planning Action: Exhuast a hero. Any player may trigger this action. Midnight. Action: Claim this objective and attach it to a hero you control. 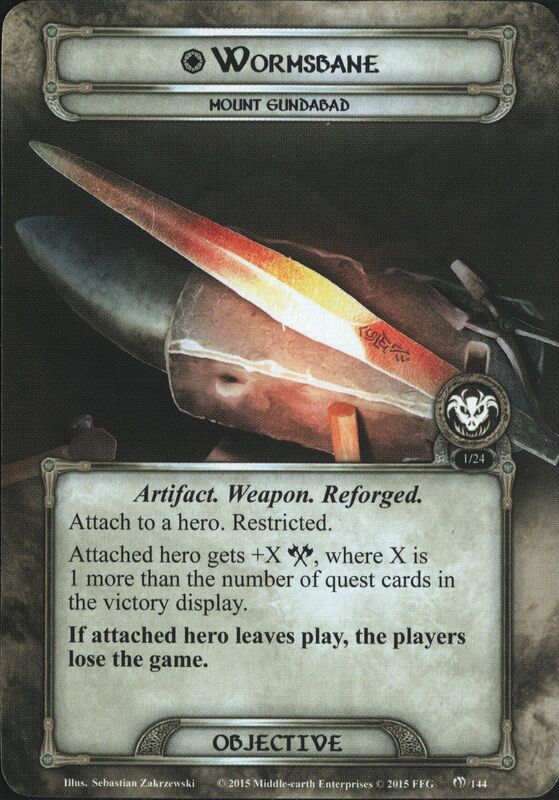 Counts as an Artifact attachment with the text: "When attached hero attacks and Oathbreaker, that enemy loses the Spectral keyword until the end of the phase." 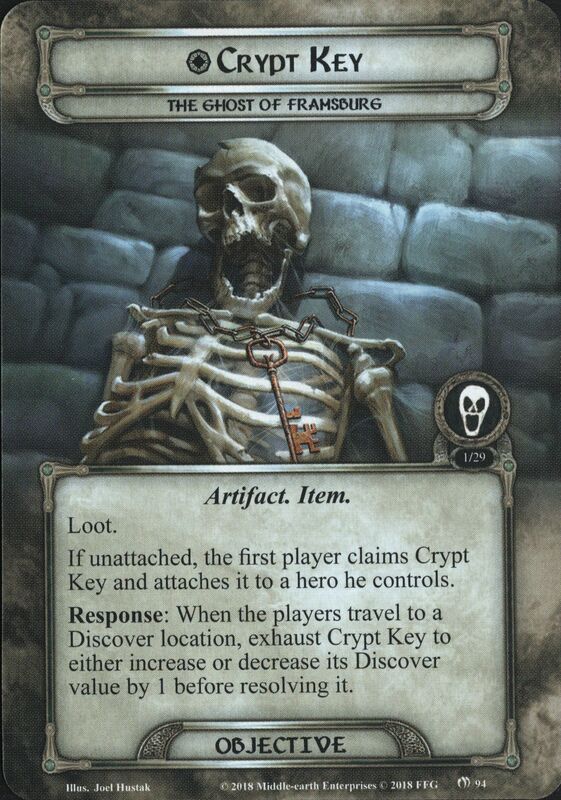 While Dark-wight is engaged with a player, that player's heros cannot gain resources from card effects. Forced: After Dark-wight attacks and destroys a character, that character's controller discards all resources from each hero he controls. If unattached, the fist player claims Map of Ered Luin and attaches it to a hero he controls. Action: Exhaust Map of Ered Luin to choose a non-unique location. That location gets -2 Threat until the end of the phase. If unattached, the fist player claims Keys of Belegost and attaches it to a hero he controls. Action: Exhaust Keys of Belegost to choose a hero. Add 1 resource to that hero's resource pool. If unattached, the fist player claims Book of Aulë's Children and attaches it to a hero he controls. Action: Exhaust Book of Aulë's Children to choose a player. That player draws 1 card. If unattached, the fist player claims Dwarven Torch and attaches it to a hero he controls. Action: Exhaust Dwarven Torch to choose a non-unique enemy. That enemy gets -1 Attack and -1 Defense until the end of the phase. If unattached, the fist player claims Blue Mountain Gem and attaches it to a hero he controls. Action: Exhaust Blue Mountain Gem to choose a player. Reduce that player's threat by 1. Cannot have player card attachments. Old Stone Troll gets -10 engagement cost for each Loot objective attached to a hero. Only the engaged player can declare attackers against Old Stone Troll. Sunken Treasury gets +1 Threat for each Loot objective attached to a hero. Travel: Each player discards 1 random card from his hand. Immune to player card effects. Forced: At the end of the round, if Enemy Camp is in play, discard 1 random facedown hero from under each stage 3. If Enemy Camp is in the victory display, return each hero under each stage 3 to its owner's control instead. Travel: Reveal 1 encounter card per player to travel here. While Arnor Battlefield is in the staging area, each non-unique enemy gets -5 engagement cost. Travel: Each player deals 1 damage to a hero he controls to travel here. When Revealed: Each player deals 1 damage to a hero he controls. If that hero is questing, remove it from the quest. Until the end of the round, treat each damaged character's text box as if it were blank (except for Traits). Shadow: Attacking enemy gets +1 Attack (+2 Attack instead if the defender is damaged). While Enchanted Steam is in the staging area, progress cannot be placed on the main quest. Travel: Each player exhausts a hero he controls. Those heroes cannot ready while Enchanted Stream is the active location. Action: Deal 1 damage to a hero you control to reduce Gladden Marshlands Threat by 1 until the end of the phase. Any player may trigger this effect. 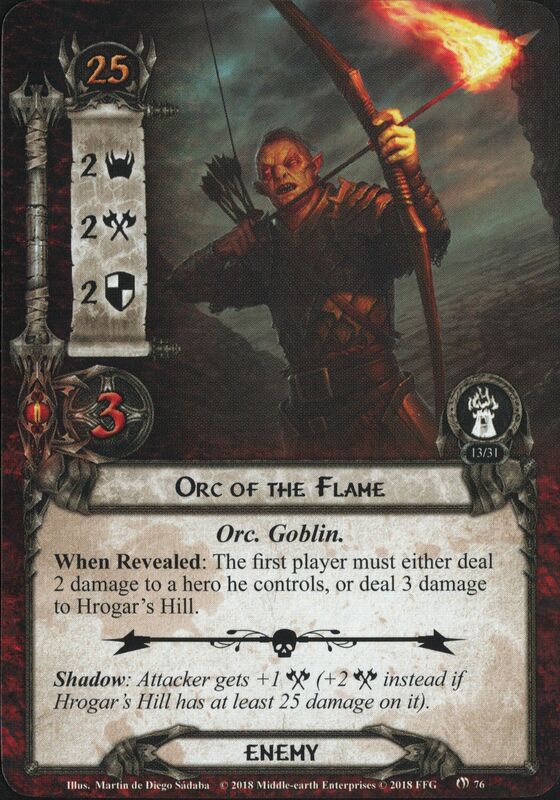 When Revealed: The first player chooses a Clue card attached to a hero and attaches it to a Mordor enemy in play, if able. 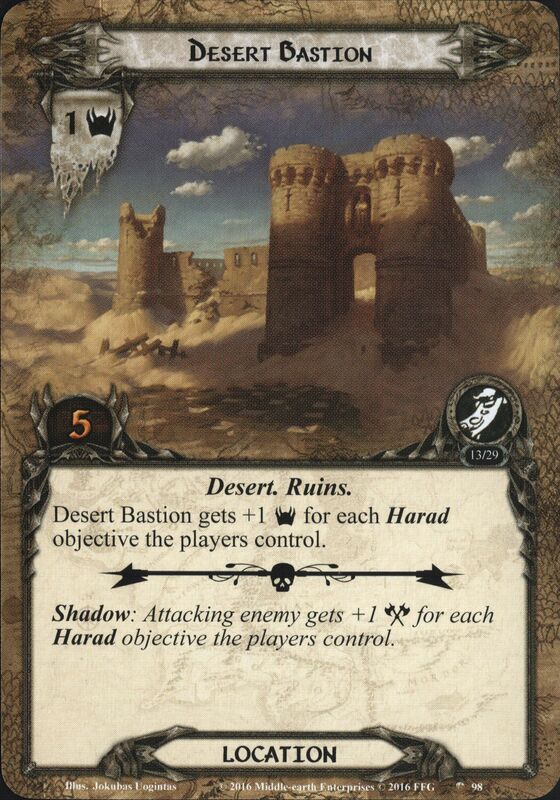 Shadow: Damage from this attack must be applied to a hero you control with a Clue card attached, if able. 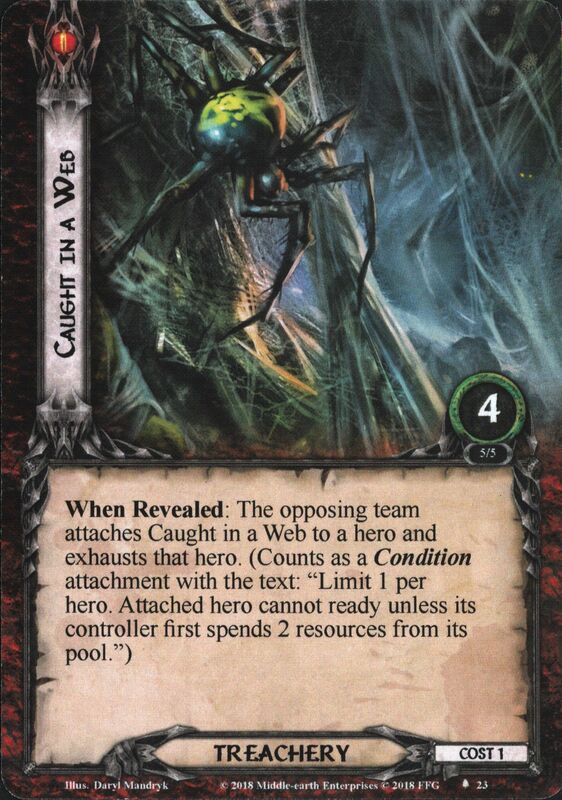 When Revealed: The player guarding Gollum must either exhaust a hero he controls or Web-spinner gains surge. Shadow: The player guarding Gollum must exhaust a character he controls. Shadow: If you have no cards in your hand, discard defending character from play. Progress cannot be placed on Fiery Depths while it is in the staging area. Travel: Each player must move 1 damage from Durin's Bane to a hero to travel here. While Alcaron's Scroll is attached to a hero, Cunning Informant gets +3 Attack. During the encounter phase, if Alcaron's Scroll is attached to a hero, that hero's controller is considered to have +10 threat for the purpose of engagement checks. While Alcaron's Scroll is not attached to a hero, Pelargir Alley gets +3 Threat. 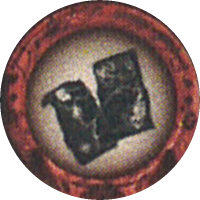 Shadow: If the defending player controls a hero with Alcaron's Scroll attached, attach Alcaron's Scroll to the attacking enemy. When Revealed: Each player must either remove a hero he controls from the quest or engage an enemy in the staging area. Each enemy engaged by this effect makes an immediate attack. When Revealed: If Alcaron's Scroll is attached to a hero, choose an enemy engaged with that hero's controller, if able. Attached Alcaron's Scroll to that enemy, then add 1 progress to that enemy. Each hero with no resources in its resource pool cannot be declared as an attacker or defender against Drúadan Warrior. Forced: At the end of the round, each player must either exhaust a hero he controls or place 1 progress token on To the Tower. When Revealed: If Mugash is attached to a hero, the player who controls that hero unattaches Mugash and engages it. Then, Mugash makes an immediate attack. Shadow: Attacking enemy cannot take damage until the end of the round. Cannot have attachments. Forced: At the beginning of each resource phase, the engaged player exhausts a hero he controls. When Revealed: If Mugash is attached to a hero, deal 2 damage to that hero. If Mugash is not attached to a hero, Fangorn's Anger gains surge and doomed 2. Shadow: After this attack, if Mugash is attached to a hero, attacking enemy engages the player who controls that hero. Forced: After the engaged player draws any number of cards, deal 1 damage to a hero he controls. 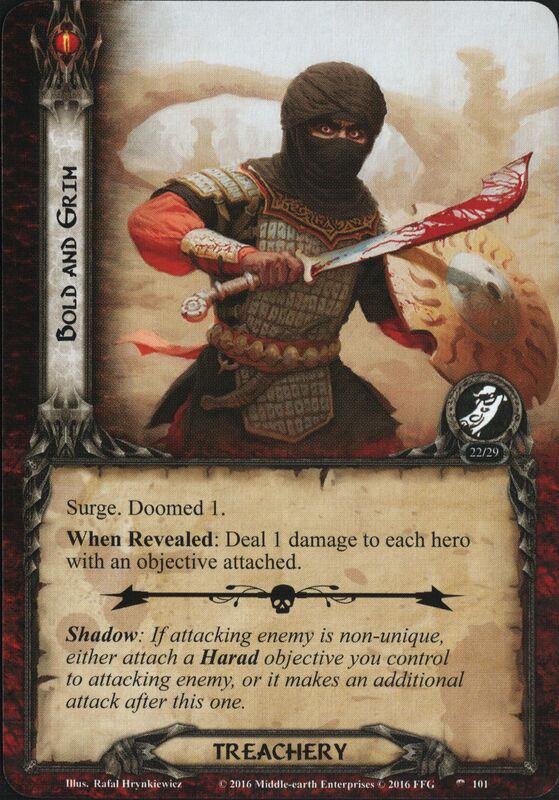 Shadow: Deal 1 damage to a hero you control (2 damage instead if undefended). When Revealed: Remove 1 resource from each hero in play. Distribute those resources as evenly as possible among Raider enemies in play or set aside. Shadow: Damage from this attack is dealt to an Aflame location in play instead of the defending character. Forced: When Desecrated Ruins is flipped over while active, remove all resources from each hero and objective-ally. Uncharted. Cannot have player card attachments. 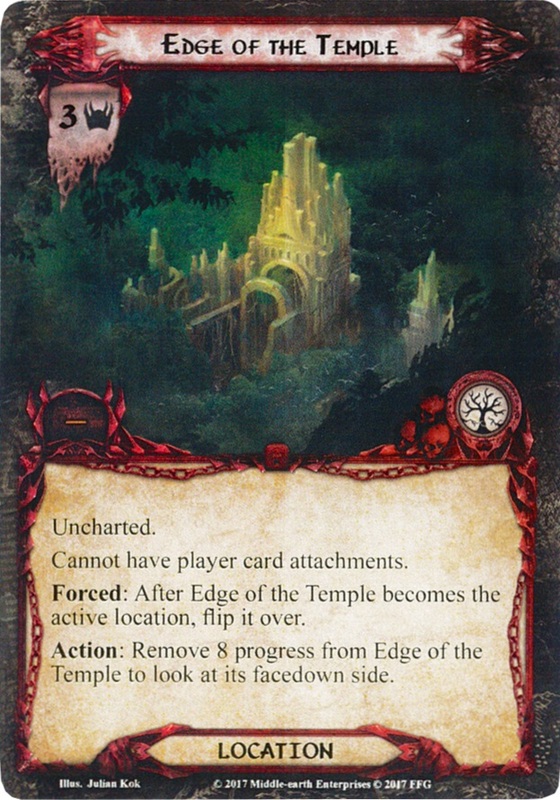 Forced: After Edge of the Temple becomes the active location, flip it over. Action: Remove 8 progress from Edge of the Temple to look at its facedown side. When Revealed: Each player must either give 1 poison to each hero he controls, or reveal an encounter card. Shadow: Attacking enemy makes an additional attack against the defending player after this one.